I was interested – although not surprised – to learn that municipailities leak large amounts of their treated water – sometimes as much as 40%. According to the CBC, that amounted to more than 26 billion (said in a Dr. Evil voice) litres of drinking water. Industry-wide, losing 10% of the total is considered “acceptable” – I have no idea whether Ottawa’s number falls within that amount. 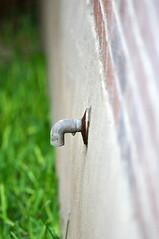 I’m on well water – if I have a leak in one of my pipes, I can empty my well and ruin it within a day. I get that we’re talking about clean water that returns to rivers and gets processed again, but it really irks me that while this is happening they’re airing commercials telling us to turn off our taps while we brush our teeth and avoid watering our lawns in order to preserve water. Sounds a bit contradictory to me – we can make all kinds of tiny changes until we’re blue in the face, but at what point do we get to take responsibility for the huge overall problem?